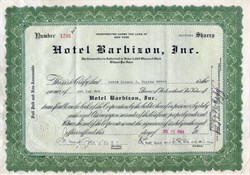 Stock Certificate from the famous Hotel Barbizon issued in 1944 and 1945. This historic document has an ornate border around it with an embossed corporate seal. This item is hand signed by the company's president, Lawrence B. Elliman and Secretary, Irving Zauderer is over 68 years old. BARBIZON HOTEL FOR WOMEN, 140 East 63rd Street (aka136-146 East 63rd Street, 813- 817 Lexington Avenue), Manhattan Built 1927-28; architect, Murgatroyd & Ogden Landmark Site: Borough of Manhattan, Tax Map Block 1397, Lots 1501-1588 On July 26, 2011, the Landmarks Preservation Commission held a public hearing on the proposed designation as a Landmark of the Barbizon Hotel for Women and the proposed designation of the related Landmark Site (Item No. 6). The hearing had been duly advertised in accordance with the provisions of the law. A total of two witnesses, representing the Friends of the Upper East Side and the Historic Districts Council, spoke in favor of the designation. On July 20, 2011, the Full Board of Manhattan Community Board 8 adopted a resolution in support of the designation. In August 2011, Council Member Daniel R. Garodnick wrote to the Commission indicating his support for the designation. The Commission received three additional letters and two e-mails of support, including an e-mail message on behalf of Place Matters. There were no speakers or letters in opposition to the designation. The Barbizon Hotel for Women was built in 1927-28 as a residential hotel and clubhouse for single women, who at that time were moving to New York City in record numbers to take advantage of new professional opportunities opening to them. The demand for inexpensive housing for single women led to the construction of several large residential hotels in Manhattan. Of these, the Barbizon, which was equipped with special studio, rehearsal and concert spaces to attract young women pursuing careers in the arts, became the most renowned. Its residents included many women who later became prominent actresses, writers, designers, and professional women, including author Sylvia Plath, who wrote about her residence at the Barbizon in The Bell Jar. The Barbizon also promoted women�s organizations and arts organizations, providing meeting space to groups such as the National Junior League, Arts Council of New York, and women�s college clubs. Designed by the prominent hotel specialists Murgatroyd & Ogden, the 23-story Barbizon Hotel is an excellent representative of the 1920s apartment hotel building, and is notable for the high quality of its design. Its vigorous stepped-back massing reflects the influence of the 1916 zoning resolution and in particular the design of Arthur Loomis Harmon�s Shelton Hotel. The Barbizon�s design is distinguished by the complex arrangement of setbacks and recessed courts, which create subtle transitions between the various elements of the design, and by the masterful handling of its eclectic mixture of North Italian Romanesque, Gothic, and Renaissance ornament. The richness of the building�s exterior brickwork that varies considerably in hue and texture, the careful proportioning of its details, and its dramatically massed roofline with its 18th story Gothic arcades and chapel-like crown have also won critical acclaim. The Barbizon underwent alterations in the 1980s and 1990s and was recently converted into condominiums but still retains its significant architectural features and historic associations. At Home at the Barbizon32 In April 1931 Chase National Bank, which held the first mortgage on the Barbizon Hotel, brought foreclosure proceedings against the Lex Avenue & 63rd Street Corp., which was in arrears on its mortgage and tax payments. In July 1932, the hotel, its fixtures, and furnishings were put up for auction and bought in by a consortium of the hotel�s bondholders, headed by realtor Lawrence B. Elliman, president of Pease & Elliman. The bondholders formed a new corporation, Hotel Barbizon, Inc., under the leadership of Lawrence Elliman, who secured new financing from the East River Savings Bank and got the building�s tax assessment lowered. With good management and a recovering economy, the Barbizon was earning a modest profit by 1938. In 1939, the World�s Fair brought many visitors and higher profits. The hotel was quick to advertise the advantages of its location near the subway and auto routes to the fair as well as its proximity to Radio City, Carnegie Hall, the Metropolitan Museum of Art, theaters, and the city�s �smart shops.�33 The hotel, which continued to bill itself as the Barbizon Club throughout the 1930s, also emphasized that it was �a cultural and social center in itself.�34 Events at the hotel included concerts, many by prominent musicians, which were sometimes broadcast on radio station WOR; dramatic performances by the Barbizon Players, an amateur group, and the Irish Theatre, a repertory group with players from the Abbey Theatre; art exhibits in the gallery of the Arts Council of New York; lectures sponsored by the various clubs headquartered at the hotel; and meetings of the Barbizon Book and Pen Club in the hotel library. This rich cultural program, the special rehearsal and studio facilities, reasonable prices, and complimentary breakfasts did in fact attract a number of women pursuing careers in the arts. The 1930 census indicates that the hotel residents included an actress, fashion illustrator, professional singer, interior decorator, and photographer�s model, as well as teachers, secretaries, salesclerks, librarians, nurses and a statistician.35 Notable residents included actress Aline McDermott, who was living at the Barbizon in 1935-36 while she was appearing on Broadway in the Children�s Hour,36 and two young actresses who later became movie stars − Jennifer Jones (c. 1936-37) and Gene Tierney (c. 1938-39). Author Eudora Welty also stayed at the Barbizon for brief periods in the early to mid 1930s when she made several trips to New York trying to find a publisher for her first collection of short stories and her photographs of Mississippi life.37 Titanic survivor Margaret Tobin Brown, whose life was celebrated in the Broadway musical and film, The Unsinkable Molly Brown, passed away during her stay at the Barbizon in 1932.38 During the 1940s several other young performers who later achieved stardom also resided at the Barbizon. They included comedian Peggy Cass, who moved to the Barbizon soon after she graduated high school to attend business school and seek her first show business break. Musical comedy star Elaine Stritch resided at the hotel in 1946 when she made her first appearance on Broadway in an ing�nue role in Loco.39 Actress Cloris Leachman, fresh from placing third in the Miss America contest, also resided at the hotel in 1946-47 while she was an understudy for two Broadway shows. Around 1945-46, future first lady Nancy Davis [Reagan] shared a room with another former Smith student who was also an aspiring actress. Grace Kelly, who epitomized the elegant young women that gave the hotel cachet and whose stay there was consequently much hyped by the Barbizon�s advertising department, resided at the hotel for three years between 1947 and 1949 while she was studying acting at the American Academy of Dramatic Arts and modeling part-time. In the late 1940s the Ford Modeling Agency began housing its models at the Barbizon. A prime factor was the hotel�s policy of not allowing men above the second floor recital room. 8 Some years later Eileen Ford commented �Where else could you put girls who were only girls? It was safe, it was a good location, and they couldn�t get out.�40 Top models who resided at the Barbizon included Carmen Dell�Orefice, Jean Patchett, Gloria Barnes, Dolores Hawkins, Dayle Haddon, Shelley Hack, and Margo Sappington, later a dancer with the Joffrey Ballet and choreographer. Edith Bouvier Beale resided at the hotel from 1947 to 1952, while she pursued a career as a model and cabaret performer, prior to moving to Grey Gardens to care for her mother. In the 1960s several young fashion models who later became well known actresses also lived at the Barbizon, including Candice Bergen and Cybil Shepherd. Two teenage actresses, Elizabeth Hartman, who later appeared in �The Group� with Candice Bergen and earned an Oscar nomination for her role in �A Patch of Blue,� and Liza Minnelli, also lived at the Barbizon during the early 1960s.41 Future model and actress Ali McGraw resided at the Barbizon for a month during the summer of 1958, while she was working as a Guest Editor for Mademoiselle Magazine. The Mademoiselle Guest Editor program, which ended in 1979, brought 20 young college women to the hotel each summer, while they interned at the magazine and got a taste of New York glamour through celebrity interviews, photo shoots, fashion shows, and cocktail parties. Among the young women who took part in the program and later achieved prominence were designers Betsey Johnson and Linda Allard and writers Joan Didion, Gael Greene, Francine du Plessix Gray, Ann Beattie, Diane Johnson, Mona Simpson, and most famously, Sylvia Plath, who wrote about her month working at Mademoiselle and her stay at the Barbizon, which she dubbed the Amazon, in The Bell Jar. By 1939 the hotel was also the residence for the out-oftown students attending the Katherine Gibbs secretarial school. This arrangement lasted until 1971, with the school eventually occupying four floors of the hotel and providing separate dining facilities and a lounge for its students. The Barbizon was also a preferred residence for students at the Tobe-Coburn School for Fashion Careers and the Parsons School of Design. In the 1970s the art gallery of David McKee, which handled such major New York School artists as Franz Kline and Philip Guston, also occupied commercial space at the Barbizon, lending the hotel luster. In 1930, Molly Brown's health began to deteriorate. She became a lonely woman living in her past glories. By 1931 Molly was living in New York at the Hotel Barbizon. This was a popular hotel for young actresses and the aging Mrs. Brown seemed out of place. On October 26, 1932, Molly suffered a number of strokes and died, alone, in her less than palatial hotel room. She died almost penniless. After a small funeral, Molly was buried, next to JJ in Long Island, New York at the Holy Rood Cemetery. Molly was 65 at the time of her death. The Barbizon Hotel is located at 140 East 63rd St. in New York City, NY. In 1981 the hotel began admitting men, and in 2002 it was renamed the Melrose Hotel. By the mid 1970s, the Barbizon was beginning to show its age and was only half filled and losing money. Realtor David M. Teitelbaum, head of Teitelbaum Holdings, a firm specializing in reviving distressed properties, was brought in to manage a renovation of the hotels public spaces and a publicity campaign to attract new residents.42 In 1980, Teitelbaum and a group of foreign investors purchased the hotel with a plan to convert it to a standard apartment building or office building. The hotel�s long-term tenants, many of them elderly and covered by rent control and rent stabilization laws, successfully fought eviction and were moved to a single wing of the hotel. A floor-by-floor renovation was begun and in February 1981 the hotel began accepting male guests. The tower studios were converted to expensive apartments with long leases in 1982. In 1983 the hotel was acquired by KLM Airlines and its name was changed to the Golden Tulip Barbizon Hotel. Renovations continued and the hotel was operated as a standard hotel with a few rent-regulated tenants. In 1988, the hotel passed to a group led by Ian Schrager and Steve Rubell, who planned to market it as an urban spa. The hotel was lost to foreclosure in 1994 but Schrager and a group of investors regained control four years later. In 2001 the hotel was acquired by the Barbizon Hotel Associates, an affiliate of BPG Properties, which operated it as part of its Melrose Hotel Chain. History from New York City Landmarks Preservation Commission, SavingsBonds.pro and OldCompany.com.